When was the last time your church presented a sermon about money? This statement is often made by those who are not giving at all. This is the Pareto rule at play: 20% of the congregation provides 80% of the funds available to do ministry. Sad but true! Money is the fuel for ministry! Without it ministry cannot happen. Think about your church budget. How much money is needed for salaries (and benefits), facilities, ministries and mission? The amount of dollars spent in each area of the church budget varies depending on the size of the church, but all of these buckets of spending are represented in each church budget. To do more ministry requires more “fuel” in many cases. Very often in the budgeting process, we realize that we may end up coming up short of accomplishing everything we’d dream of doing. Apart from “compelling” people to give more, how can we be intentional about growing the finances of the church? If we want to see increased giving in our churches, we cannot keep doing the same old things the same old way. We need to think differently. The first place to start is with Vision. The question must to be asked – What is the Vision God has given to our church?Hopefully, your leadership team has developed a clear Vision for the next 2-5 years. I cannot over emphasize the need for development of a Vision. If you do not have Vision, your congregation will not get fully engaged in giving. People give to Vision! If you have developed a Vision, be sure you are communicating it formally and informally. When is the last time you shared your Vision from the pulpit? Do most in your congregation know where the church is headed? Do not shy away from teaching about money and giving on Sunday mornings and throughout the week. The Bible speaks about finances more than many other topics. If Jesus was unafraid to talk about it, we shouldn’t be afraid either. Teach couples, singles and families about budgeting. One great tool is to have a lay person in the church lead a class, such as Financial Peace University or Crown Financial. People often do not give because they are feeling a personal financial burden. Offer classes as a service to your congregation. When people have a biblical understanding of how to manage their own household budget, they tend to be a more cheerful givers. Vision drives giving, but stories are the best vehicle for sharing the impact of vision. Celebrate what God has done within your church because of the generosity of the congregation. Don’t just share stories of what’s happening inside the church, share stories of what’s happening beyond your four walls because of your congregation’s sacrificial giving. Look for credentialed financial planners in the church, that specialize in Planned Giving, who can hold classes to explain the concepts and opportunities that can impact the church in the future. As Baby Boomers begin to retire, encourage your congregation to consider “tithing” on their estates. It is important that no one in your church feel duped or manipulated into giving to the church. However, many people have simply never considered this possibility. This is why we recommend outsourcing this training to a trained professional rather than take the topic on yourself. Do you know the giving capacity of your church? 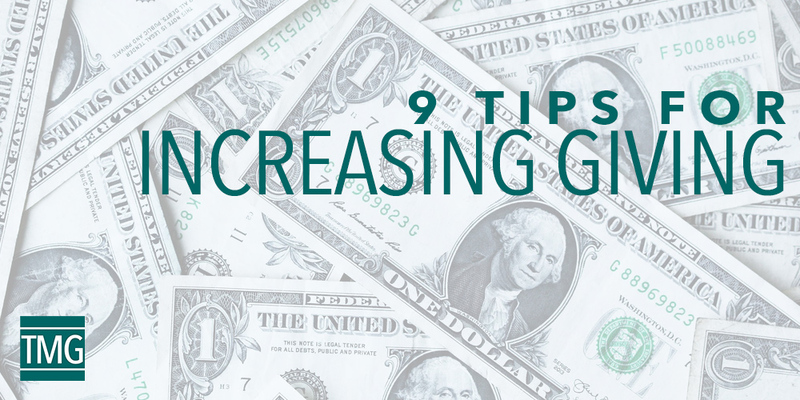 What if every person increased their giving by 1%? What kind of impact would that make on the finances of your church? Be intentional, when necessary, about cultivating champions in your church. It is very common for the giving of a few to inspire the giving of the many, when this cultivation is intentional. This book has additional tips, suggestions, and methods for helping your church become financially healthy. There are many ways that giving can be developed within your church body. Many of which have been shared here. At times it is helpful retain some outside help in the area of finances and giving. This can be particularly true if you want to change how you develop your budget and the processes you use. TMG is a resource you might consider retaining. God bless your church and the development of your budgets! May God give you Vision for your church and may you see it fulfilled in the coming years. Ron Donnini is the Chief Executive Officer of The Malphurs Group. Ron is a seasoned corporate executive, with a history of effective general management experience and returning value to key stakeholders. He has had the role of interim Executive Pastor in a large church setting. He was responsible for staff development, organizing staff for ministry deployment and oversight of daily church operations. Ron has a passion for growing leaders. Ron currently resides in Arlington, Texas, with his wife Shawn, where he enjoys golfing, reading and taking in an occasional baseball game. Interested in Building a Better Budget? Join us for our upcoming webinar! It’s completely free. This webinar is free. There’s no sales pitch. The sole intention is to help you become a better leader and help your church get healthier! Space is limited. I am amazed that you never once mentioned the church meeting peoples needs as a way to increase giving. Amazed and sad because you hold yourself out as an expert, but don’t understand this basic principle. So here it is… God moves in people’s Spirits to give when churches are meeting peoples needs. Please accept that as admonition… not criticism. Ask God to show you… it will forever change how you think. Thanks for the comment, Rusty. We value the feedback. I think you may have misunderstood the heart behind the sixth tip about sharing stories of life change. When we partner with churches, we often see that they ARE meeting needs—but the average person in the congregation does not know that lives are being impacted. Perhaps we could have been more explicit, but our assumption is that a church is on mission: making disciples and meeting needs. Unfortunately, there are a lot of good churches that are doing gospel work but still struggle to make budget. These tips are geared towards this situation. Thanks again, Rusty. Point well taken!